Left to right – Pirate FM breakfast presenter Neil Caddy, Jack Phelan, Jane Cashmore (assistant principal of Truro College – the award’s sponsors) and Pirate FM breakfast presenter Lucy Start. Picture courtesy of Pirate FM. 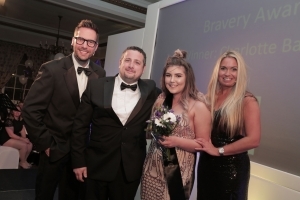 Left to right – Pirate FM breakfast presenter Neil Caddy, Rob Kellow (MD of RG Kellow – award’s sponsors), Charlotte Barriball and Pirate FM breakfast presenter Lucy Start. Picture courtesy of Pirate FM. Two saltash.net students have been recognised for their fantastic work in the community, receiving awards at Pirate FM’s Local Heroes Awards ceremony. Jack Phelan and Charlotte Barriball were among 15 winners from around the county to accept awards. The ceremony, which took place on Friday 7 April at Tregenna Castle Resort, recognises exceptional and inspiring people around Cornwall, and both Charlotte and Jack certainly match that criteria. Jack was named Pirate FM’s Young Person of the Year, whilst Charlotte was named the Bravery Award winner. Jack is a fire cadet in Saltash with the Cornwall Fire and Rescue service, and he has also successfully campaigned and raised money for a defibrillator to be installed in Fore Street. 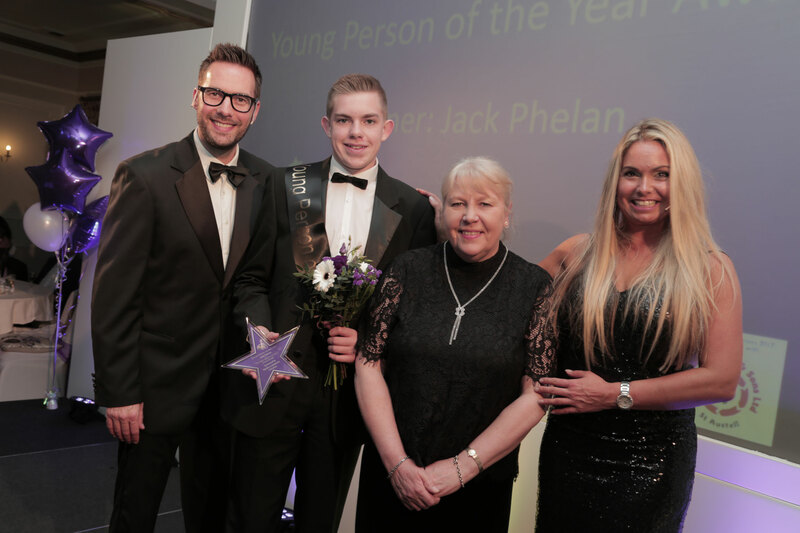 In May 2016, Jack was also awarded at the May Fair as the Saltash Young Citizen of the Year, for his inspirational work highlighting areas of safety concerns in the local community. 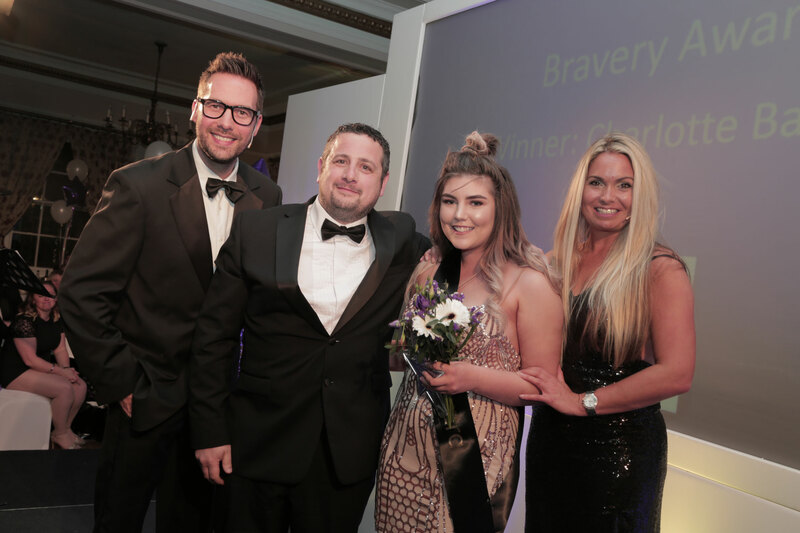 Charlotte Barriball was recognised for her unbelievable courage and resilience – as well as her fantastic charity work, which has raised £8000 from children’s charities – and was the recipient of the Bravery Award. Charlotte was diagnosed with Pre B Lymphoblastic Lymphoma, a type of cancer treated as Leukaemia, in the summer term of her Year 10 GCSE course. In 2016 Charlotte finished her GCSE’s, achieving fantastic grades and even completing an entire PE course in six weeks, before moving on to Sixth Form at saltash.net. The event was hosted by Pirate FM’s breakfast show presenters, Neil Caddy and Lucy Start, and featured a special performance from traditional folk act, The Fisherman’s Friends. Pirate FM’s Managing Director, Mark Peters, said: “Here at Cornwall’s Pirate FM, we know that there are people all over Cornwall who go the extra mile in our community. “We also know that some are doing quite extraordinary things, without even realising it. That is why we were proud to host Cornwall’s 7th Local Heroes Awards. “It is our chance to recognise the people that make this a great county to live in”. Congratulations to both Jack and Charlotte for their very richly deserved recognition.